Strawberry 'Charlotte' (Fragaria vesca 'Charlotte'): growing, planting, caring. An everbearing cultivar - vigourous and hardy - producing from June to the first cold days. A fruit as long as broad, medium sized, conical, medium red with a strong glossiness, and a firm flesh, light red with light red core, with a distinctive taste of wild strawberry. A perennial, stoloniferous plant that blooms in the spring, or in the summer for everbearing varieties. White flowers with yellow hearts. The leaves are trifoliate and have serrated folioles. There are over 600 varieties of strawberries! Plant strawberries starting at the end of summer through autumn — September is often considered the best month for planting. Choose a location that receives partial shade from the south, and more sun towards the north as it rises! If your ground is permanently mulched — especially with compost — all you have to do is make a hole that's slightly larger than the little potted strawberry and plant it, tamping down the roots well. If you have a more "traditional" approach to gardening, clean and weed the plot beforehand. Enrich the earth with compost and light potting soil. In any case, leave at least 30 cm of space between each plant. If you have a number of rows, leave around 40 cm of space between each. When planting, keep the neck of the plant level with the ground, tamp lightly to remove air from the roots, and water gently. 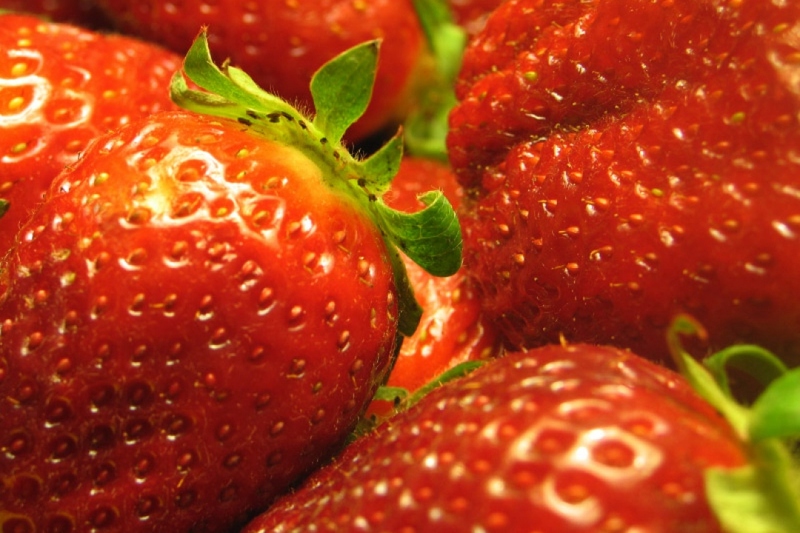 Strawberries are very thirsty and need to be watered regularly, especially in hot weather. But be careful! They also don't like too much moisture, so water often with small amounts rather than flooding them. In summer, water at night or very early in the morning so all the water doesn't just evaporate in the sun. Mulch around the base of your strawberries to help maintain a good level of moisture all summer long — this will also help keep the plant tidy, reduce weeding and keep the fruits clean for harvest. You can use wood chips or straw as mulch. Some people like to lay down black plastic in humid regions, as strawberries don't like excess water. However, you'll have to deal with the unpleasant appearance of the plastic. The function of the plastic can be fulfilled instead by planting in mounds and using natural mulch. Weed between the plants, keeping an eye on the position of the fruits. Don't hesitate to remove some leaves to let sunlight in or to get rid of any fruits that look like going bad before they're ripe. Remove any runners that you don't want — these are small, above ground stems that grow outwards from the plant in order to bury themselves in the ground a little ways away and give birth to a new plant. These runners will be very practical when it's time to renew you plants, but for the time being they actually run the risk of suffocating the plant! Get rid of them without a second though, there will lots more where they came from. There are two types of strawberries — June bearing strawberries have a single cycle of fruit production lasting between 25 and 45 days, while everbearing strawberries produce fruit from spring until the first autumn frosts. Keep a close eye on your strawberries — a green fruit may sometimes ripen after just a few hours in the sun! Strawberries aren't very demanding! Give them a nice boost with compost at the end of autumn or the beginning of winter. Avoid adding anything in spring, as strawberries can be sensitive to excess nutrients — nitrogen in particular, which encourages foliage growth and may result in less fruit production! Heavy freezes may alter the culture of your strawberries — mulching is practically indispensible in places where temperatures regularly drop below freezing. Use a good layer of straw and dried leaves to protect your plants. In spring, uncover the plants for a few weeks before laying down new mulch, this time to protect against dryness. After two or three years, your strawberry harvest will typically become less and less abundant — this is a good time to think about renewing your plants. A relatively easy technique that lets you replace your old plants with young, vigorous new strawberries at almost no cost — layering. After a harvest, choose runners that have at least one node and place them in small pots filled with potting soil. Don't bury them completely. Keep the node in contact with the potting soil using metal garden staples. Keep an eye on the potting soil, which should be kept lightly moist for a few weeks. Once the roots are well developed, the runner is ready to be separated from the mother plant and transplanted elsewhere! Clear up the original plot, which will be used for crops.